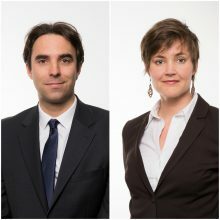 LALIVE is pleased to announce the promotion of Thomas Widmer and Laura Halonen to Counsel of the firm based in Geneva, effective from 1 January 2014. Thomas Widmer, a Swiss attorney, joined LALIVE in 2007. He specialises in domestic litigation and in intellectual property, an area in which he has successfully continued to develop the firm’s practice. Thomas Widmer graduated from the University of Geneva in 2003 and also studied at the University of Utrecht, The Netherlands. He holds two certificates in intellectual property delivered by the World Intellectual Property Organization (WIPO) and regularly publishes in the field. Thomas Widmer speaks French, English and Spanish. Laura Halonen is a Finnish national and a Solicitor of England & Wales and joined LALIVE in 2010. Her main areas of practice are international arbitration, with a focus on investment treaty arbitration, and public international law. She has acted as counsel, arbitrator and tribunal secretary in numerous international arbitration proceedings (under the rules of ICSID, UNCITRAL, ICC, WIPO, Swiss Chambers, SCC and FCC) in particular in the energy, transport, pharma and biotechnology, finance and telecommunications sectors. Laura Halonen studied at the University of Oxford (BCL, MA). She speaks English, Finnish and French. LALIVE now comprises 16 partners, 8 counsel and 42 associates in Zurich and Geneva office, who together advise the firm’s domestic and international clients in all key areas of dispute resolution and business law. See more information on Lalive’s areas of practice. The firm wishes Laura Halonen and Thomas Widmer much success in their new roles.